Oi vey! Animal Man here, with another JLA review. Phew, this one was rough, so I'm just going to come out and say it. Had to get a bit on the tipsy side to make it through this title. If you don't believe me, then strap yourself in, folks, because we've got a right sizzler here. A right sizzler created by Matt Kindt, Tom Derenick, Eddy Barrows; plus the Publisher: DC Comics, in January, 2014. To QUOTE Vaas Montenegro: 'Did I ever tell you what the definition of insanity is? Insanity is doing the exact same f*cking thing -- over and over again -- and expecting sh*t to change. That. Is. Crazy. The first time somebody told me that, I dunno, I thought they were bullshitting me, so I shot him. The thing is, he was right'. 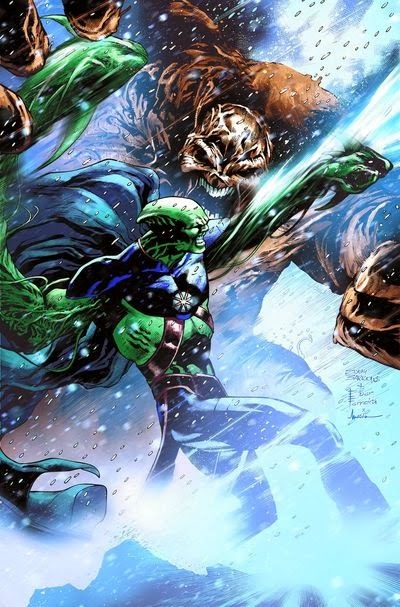 Martian Manhunter and Stargirl were imprisoned together, then they were free, and then they were the same person, and then they separated, yet they were fighting bad guys. When suddenly, for reasons of her own, Stargirl decides she needs to help her family out, whilst Martian Manhunter gawks at her for an entire book. The art in this adventure is occasionally pretty fantastic, plus Clayface's cameo is nicely sketched out as well. And even though I'm not what'd you call a huge 'Stargirl fan', some of her art in this issue is very powerful indeed. Moreover, the villain at the end gives me some hope that the creators want the story to actually progress, but I'll discuss that point later After all, having to read so many repetitive issues, finally we have some progression in this series. Well, it took them long enough, didn't it? For all the good, there were plenty of times where the art quality drooped like the skin of the elderly. Emotions were often stale, plus action sequences were usually quite blurry. And for every good piece of art there were a handful more shoddy ones. Also, the new villain of the week -- Despero -- is not a very good villain in my honest opinion. I'm highly doubtful any good will become of him. Lastly, I'm seriously tired of this "everyone's gone, has Stargirl proved herself yet?" story-arc. It's getting old. Stale. And I feel like I'm watching the Dragon Ball Z transformations, where one has to sit through episode after episode just waiting for something, anything, to happen. It's mind numbing at this point! Now to quote the queen of pop, Madonna, 'Time goes by...so slowly. Time goes by...so slowly. Time goes by...so slowly'. The way I see it, this issue has the same odor the corpse in that Stephen King movie starring kid Wil Wheaton probably had. Putrid, and well overdue to be buried. Even in the drunken stupor I put myself in to write this review, this issue was nothing more than a short waste of time. And as fun and as stupid as 'Forever Evil' has been, it's almost over. Fingers crossed. Pretty please. May Allah be praised. Still. We have Justice League United to look forward to. So less people stuck in 'Firestorm land' and more bros for Animal Man to play with. Hey! I say that's a win-win situation.